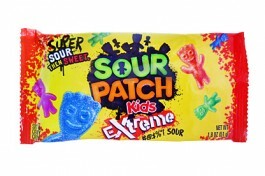 Sour Patch Kids Extreme. Eerst super zuur dan lekker zoet! Sugar, Invert Sugar, Corn Syrup, Modified Corn Starch, Antioxidant (Lactic Acid), Tartaric Acid, Citric Acid, Natural and Artificial Flavouring, Colours (E129, E133, E102, E110).